For those of you using newly released Firefox 3, or willing to give it a try, you can take advantage of a new feature that lets you set Gmail as the default for all email links -- those that contain "mailto:" in them. If you're like me and don't have a default email client set up, then clicking these links typically launches an installation wizard for a destkop mail client, or opens some email software that you don't actually use. 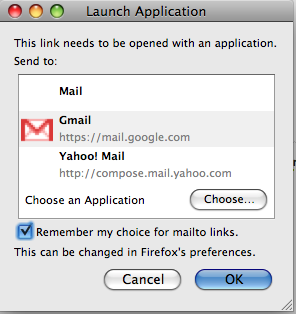 Now you can configure Firefox to launch Gmail when you click on email address links and avoid the hassle. 1) Go to Gmail and sign in. 2) While in Gmail, copy and paste the following into your browser's address bar and hit enter. 3) Click "Add Application" when you are prompted1. Congrats, you just added Gmail to your browser's list of mail clients.